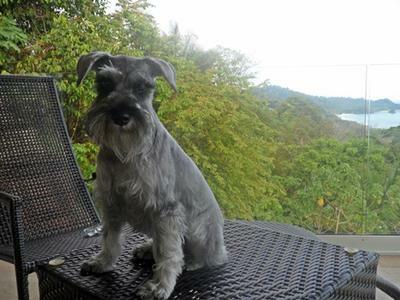 Angel is a miniature schnauzer, a litle girl of 2 and a half years old, who brings light and love to everyone who has the opportunity to be around her. She loves to play with her toys and run around the house like a little rabbit, but specially she loves to play with other dogs and bigger than better, she does not know fear, so I think she feels that she is a big dog ..
Angel came into our lives when she is was 4 months old. When we got her, she was very sick and had a very heavy cough during a month. We thought that she is not going to make it, although with the help of her veterinarian, love, prays and more love she got better and better. Since that I believe that she appreciates very much our love because she is so kind to us, and everyone (people and other dogs), she is a very great company to be with. In addition, she never has been mean or aggressive, but also she enjoys every meal, every walk to the park, and every kiss on her little black nose. She always is happy to see us to come back home, she just lives in the now .. in the present moment. Angel always is well behaved, she has learned a lot things in a very short time. we take her everywhere we go, she loves to go on every family trip, she is like a little star because everybody always stops us to pet her and tell us how pretty she is. And now she is certified as a service animal, so we can share her love to everyone who needs it. Comments for Angel .... My little babe Muppet !! The love of Angel is abundant. She brings peace where ever she goes. 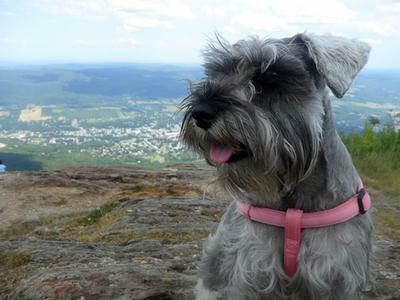 When in a pet park with 20+ dogs, if there is another Schnauzer present, its like a magnetic attraction, they run to each other. Time and time again I have seen this happen. They are a very special breed,a gift from the heavens. Nice job Leonardo !!! 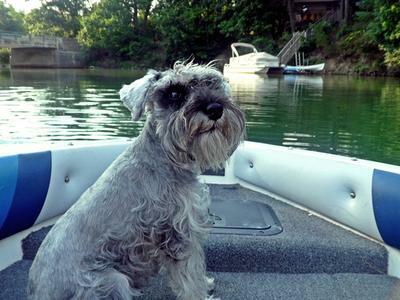 My boy, Kirk, sends his regards to this beautiful and full of life, looking mini schnauzer. She looks happy and as if she knows the good life she has. Schauzers are like that; lots of loving spirit, we are all privileged to have one. What a beautiful and Honor surprise .. We are very happy for this Honor .. Our babe Muppet sends you a very warm guauuuu !! Angel is very happy and proud .. She sends her love and Happiness to all of you ..
Great news and they are wonderful because on next April 16th .. Angel will celebrate her birthday number 3 .. we are very honored to have her in our life ... God !! what a beautiful piece of heaven She is .. !! Thx So much Guys ! Such a sweet story, i am new to the site and already enjoy reading the stories. Love to angel! Bless her heart!!! XOXO to sweet Angel and her family! What an awesome story....makes my heart smile!!! 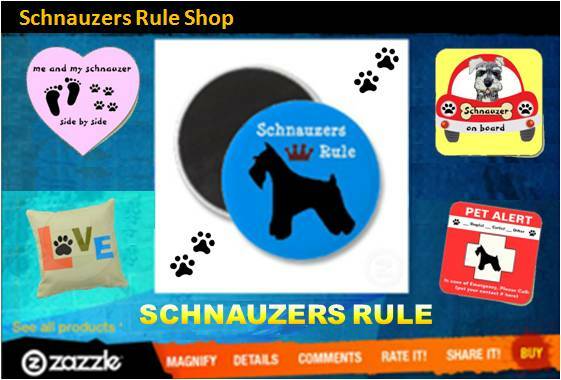 Congratulations on winning Schnauzer of the Month. 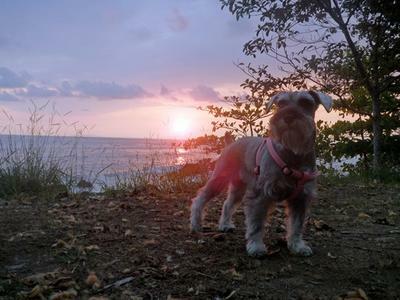 Angel is such a pretty schnauzer and from all the previous comments you can tell she is a very special little girl that's much loved. Angel is so pretty and beatiful pictures ! Love for Angel ! Esta precioso realmente que bien que esta concursando, sera un digno ganador! Angel is so pretty ... a doll . I hope she can win just look at this beautiful puppy face and those pics are so well taken . I dont know Angel puppy, but those pictures express how sweet and cute she is .. I hope that she wins !! a good looking babe ! Angel is so adorable !!! she looks like a doll . Such a cute little dog! :) You go Angel! I've had the privilege to meet Angel in person-- what a wonderful four-legged friend that she is! She is definitely nothing short of a beautiful pup; with such a loving personality, Angel was born to be a star! Wow !! what a swettie puppy ... we loved to read her story very touching, we have 2 pups but I can tell that Angel is a little star ... She might win .. my wife says that she is ready to be a famous dog lol Good luck Angel !! Angel is already a winner ... soooo cute and beautiful Black eyes. I think she is the cuttest puppy in the contest .. so pretty and glam ! Go Angel ! By far the cutest puppy!! She's beautiful - hope she wins! OMG .. she is so pretty little puppy, she looks like a model ! Se nota que toda una chineada, está hermosa..y obvio tiene un amigo que la cuida y la ama demasiado..
Que hermosura, Dios la bendiga!! Angel is Leo's best friend. He is so beautiful and he is a great dog!!! Also he is so photogenic each picture he has!!! I love angel. She is the best there has ever been ! An oracle of light and love, always leaving a place better when she visits. To have a pet is the most beautiful think in the world, and Im so happy because my friend found a beautiful angel in his life. Angel is an angel!!! !